The city of West Hollywood has debuted the Sunset Experience, a pilot program designed to improve walkability and activate the pedestrian realm on the Sunset Strip. The city worked with the Gehl Studio on the project which consists of three interconnected installations: painted and bollard-protected curb extensions at four intersections; a parklet in front of Book Soup; and “connective sidewalk trail” treatments including public art, wayfinding, and sidewalk seating. The bright red curb extensions are located at Sunset/San Vicente, Sunset/Larrabee, Sunset/Holloway/Horn, and Sunset/Sherbourne. Tightened corners are designed to make drivers slow down as they are turning, and the extra protected space decreases the crossing distance for pedestrians. The project also includes a painted pedestrian refuge island at Sunset and Holloway. The parklet, which was the location of a project launch celebration on December 4th, is the first in West Hollywood, following the installation of parklets in other L.A. County cities including Long Beach, Los Angeles, Huntington Park, and Santa Monica. 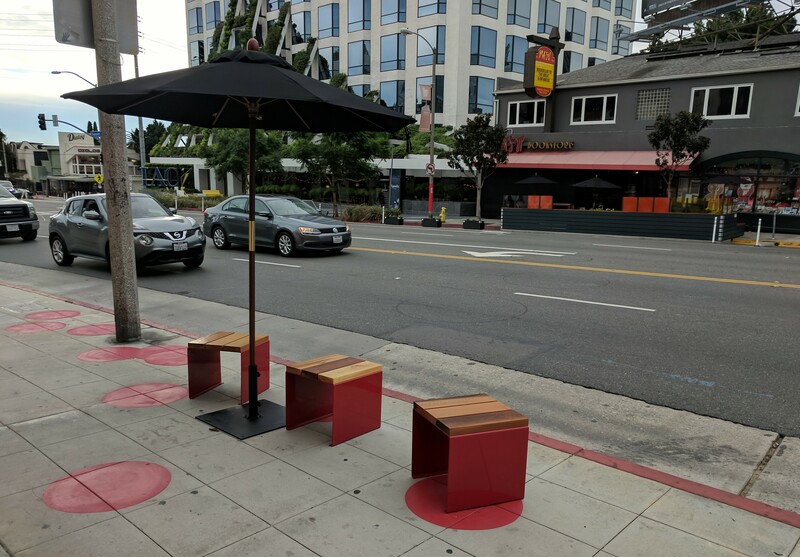 In addition to the parklet, the Sunset Experience also includes a small sidewalk seating area on the north side of Sunset between Larrabee and Horn. Decorative elements also liven up the streetscape. The curb extensions were designed with whimsical elements by street artist the Art of Chase, who also recently created a city of West Hollywood-sponsored installation between Sherbourne Drive and Horn Avenue. 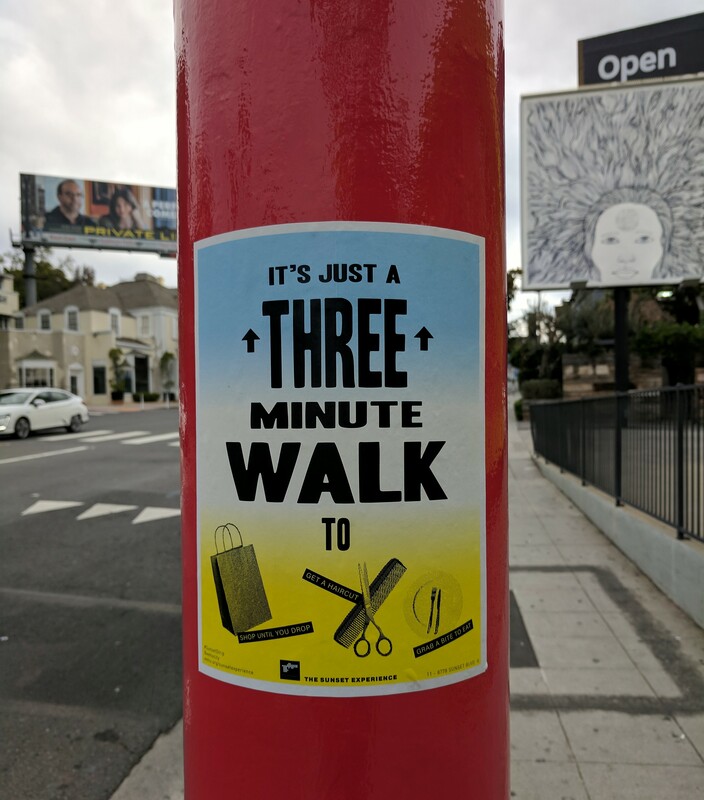 Pedestrian-oriented signage on painted street lamp poles encourages pedestrians to walk to services in their ‘ped-shed’ and highlights the history of the Sunset Strip. Following the pilot, the city will review the results and decide whether the installations will be modified, removed, or made permanent. A Streetlife Action Framework plan will also be written, which will include recommendations for further improvements along Sunset Boulevard in West Hollywood. The Sunset Experience follows other efforts by West Hollywood to make walking safer, including adding pedestrian-activated signalized crosswalks on Santa Monica Boulevard. West Hollywood has also made some efforts to improve accommodations for cyclists, including installing bike lanes on Fairfax Avenue through the city, partially via a lane reduction. The city has also recently released a request for proposals to create neighborhood greenways along Willoughby Avenue and Vista/Gardner Street, a project supported by both the West Hollywood Bicycle Coalition and the Mid City West Community Council. Unfortunately, to date, West Hollywood has had a safety blind spot when it comes to Fountain Avenue, famous as the speedway Bette Davis recommended young actors take to get into Hollywood. Despite a consistent stream of crashes and fatalities, West Hollywood has refused to reduce lanes and increase space for cyclists and pedestrians. 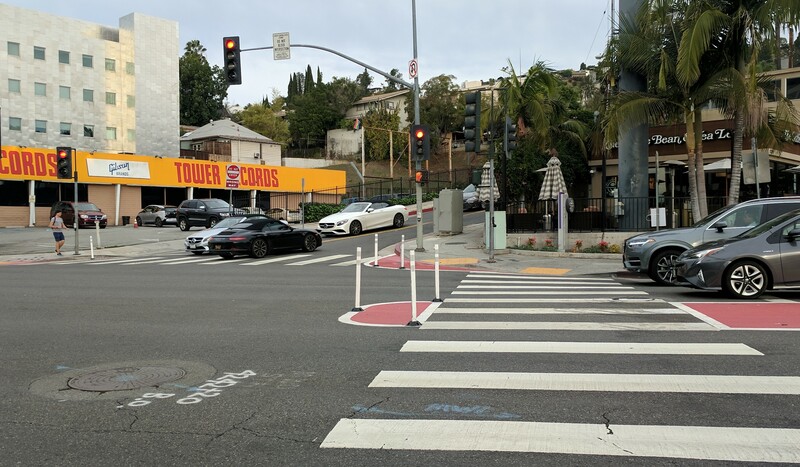 Even after the most recent tragic fatality, West Hollywood failed to embrace a comprehensive solution that would bring speeds down, instead opting for minor improvements, including high visibility crosswalks and bulb-outs. Haven’t yet met anybody in the neighborhood who likes these modifications or feels safer as a result of their existence. The impact may not be huge yet but these are a step in the right direction. Looking forward to additional parklets (maybe in front of a bar or restaurant next?) and more permanent/robust/landscaped curb extensions. It would be nice to see additional pilots added on to this to better demonstrate these ideas to skeptics. It would be great if we could look at bus islands and bike lanes too but that might be a stretch given the limited space. Yes, but shortening crossing distances means pedestrians spend less time in the lanes built to zoom around in! it’s a start. More please. New pedestrian safety improvements spotted at the intersection of First Street and Main Street in downtown L.A.